My son has been watching a lot of domino-toppling videos. Turns out dominos are kind of expensive - but pretty much the easiest thing ever to model in Tinkercad. We made standard-sized 1 7/8 x 15/16 x 1/4 inch dominoes. Settings: On the Replicator 2, MakerWare low with no raft. On the Afinia, 3D sofware on .3mm fast with a raft. Technical notes: It works best if you print these so that the long skinny sides are at the top and bottom, since those are the sides that will come out the roughest. This makes the large front and back very clean but also allows the dominos to lie smoothly when you are using them. 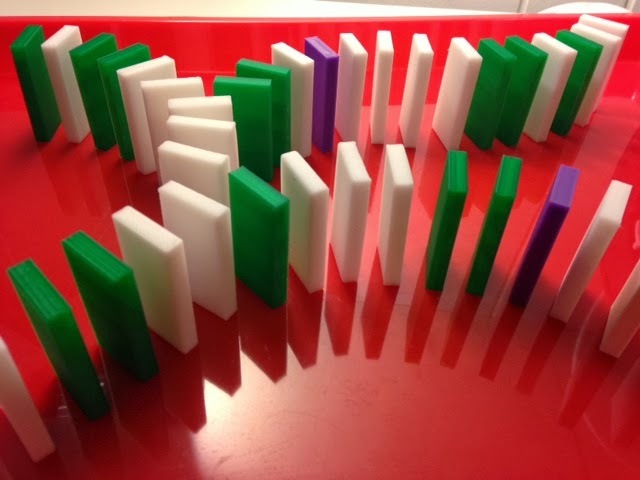 We tried making a few variations of dominos with gaps and holes to use less plastic, but nothing was as fast to print or as stable to use as a plain old rectangular solid.